As the class watched, Amity whipped out this demonstration of letters penned with a nib dipped in tinted water and later enhanced with graphite. This was one of my favorite workshops ever! It covered some familiar ground with pencil drawn letters and emphasis on the “pressure, release, pressure” technique but instead of viewing these letters as a means to making our pen drawn letters better, this workshop took it one step further by encouraging us to see these lively and lovely letters as a finished product. Day 1: The first morning was spent practicing hand control and getting different gradations of color from our pencils — experimenting with a range of pencils and graphite sticks from very hard to very soft, then practicing a pressurized monoline alphabet. The results were lively letterforms! The afternoon was spent building up letters and filling them in with the gradation of graphite that we practiced in the afternoon — these letters had light and danced — very fun! Day 2: The morning saw us working up layouts for a quote of our own choosing. Amity had us follow her typical pattern for deciding on a layout. Later in the morning and for the rest of the day, Amity began to demonstrate techniques to enhance our letters with water soluble graphite. We applied it to wet paper, put it on dry paper and then wet it with a brush or spray bottle of water. We grated it into wet letters, grated it on dry paper and rubbed it in, practiced techniques of reverse lettering and shadowing our letters! And the use of contact paper to create depth in our pieces. Amity was a good instructor — very friendly and positive and generous with her tools and work. Her handouts were excellent — and I came home with new inspiration and a desire to keep practicing my hand-drawn letters! 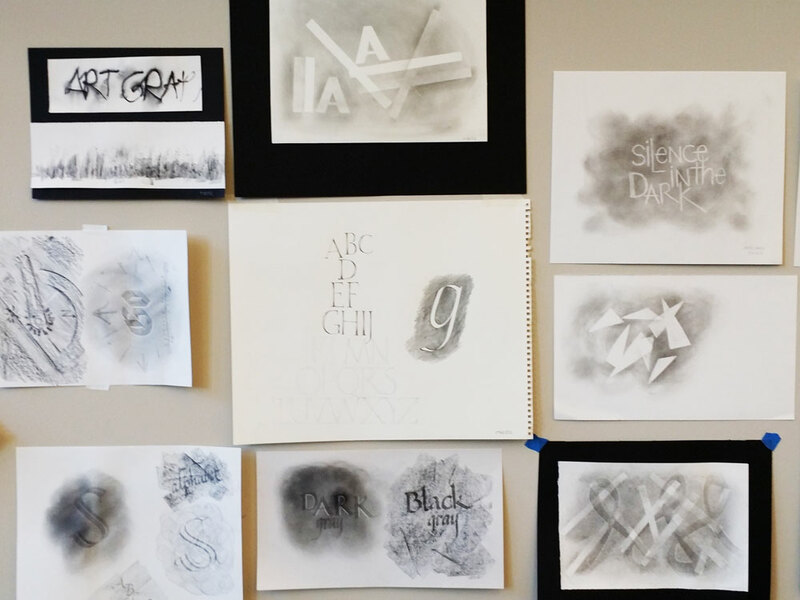 Students' experimentations with graphite were taped to the wall to admire and learn from. Many thanks to the committee who made this workshop available and free of charge to the lucky 16 who were picked! The number of techniques that Amity showed using graphite tools was amazing!